This Friday we are playing a very important match. What should I eat to be on top of the game? If the match is in the morning: Breakfast: : Tea + granola with yogurt and fruit. To begin, season the chicken and package it together with the curry, paprika, nutmeg and honey. Next, cook it in the SmartVide at 65ºC (149ºF) for one and a quarter hours. Meanwhile, cook the pasta and mix it with the rest of the ingredients and a little oil. To finish, sear the chicken breast in a pan to mark it and then filet it. 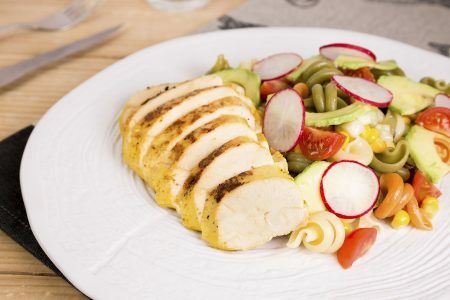 To serve, place the pasta on a plate with the avocado and the rolled radishes on top and finally add the chicken. A pre-competition meal should be consumed between 3-4 hours before the game. Low in fibre to avoid gastrointestinal discomfort. Fibre supply should be limited prior to competitions; so avoid grains and carbohydrates that are easy to digest. Cooking should be low in fats, with no batter or food rich in fat, including meat that is not lean, sausages or things like pastries, etc. Protein intake should be moderate, a second dish with low fat, for example lean meats, white meats or white fish. Sugar must also be limited. In this case the vacuum helps to ensure optimal cooking of the chicken, without drying it and without adding a lot of fat. Also, the flavours will be concentrated.